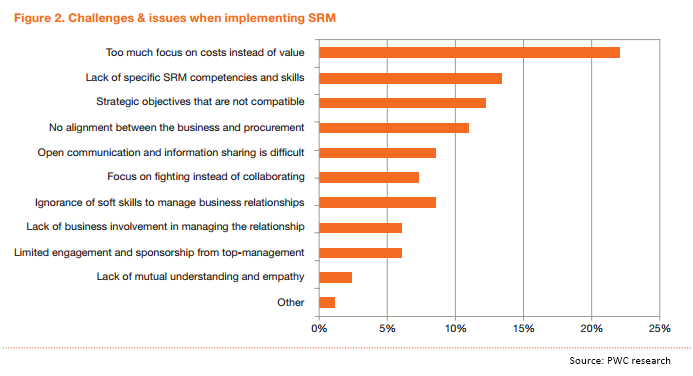 SRM Training: Are you maintaining a lasting relationship with your suppliers? Supplier relationship management has undergone a major transition in the last few years. Large corporations have understood that supplier management is the key factor for an effective procurement organization that is properly optimized and accountable. It is no longer about minimizing the cost of separate transactions but about maximizing the value of supplier engagement. Leading procurement executives are increasingly recognizing that developing partnerships with main suppliers can indeed deliver substantial benefits to both the buyer and supplier. Prior to this transition, businesses were prone to neglect SRM since their main focus was to nurture customer relationships and reduce costs. Shortening order fulfilment leads times. However, the same research mentions that while the benefits of SRM are acknowledged, the average SRM maturity level is still low. This explains the emergence of corporate training to ensure a proficient supplier relationship management. With an effective training and development program, this area can gain traction and perform better in favor of an organization. Strategic partnerships are at the top of the corporate agenda of global organizations and SRM is seen as one of the few remaining procurement topics that can still make a major difference. Nevertheless, numerous organizations find it difficult to initiate, develop and manage their supplier relationships. With reference to the findings of the PWC survey, there is an indication for a call to action to implement SRM training and development programs. The PWC research further highlights four key value drivers for supplier relationship management: innovation, sustainability, leagility and resilience. Both partners must be able to develop and deploy these capabilities. Elements like trust, open communication, empathy and a win-win orientation are actually prerequisites to actually benefit from these capabilities and eventually function properly. Training and development programs can be a proficient way to encourage these qualities and help employees understand the core of SRM. Such training courses involve topics such as the process to run SRM, supplier identification, supplier segmentation, relationship analysis, relationship management etc. All these lead to in-depth insights about supplier relationship management which consequently result into more profitability and positive outcomes for the organization. Setting up deals with new suppliers involves significant costs. A good supplier relationship management can reduce a lot of these costs. By training the staffs about how to maintain a strong relationship with suppliers, they can develop mutually beneficial relationship with key suppliers which lead to cost savings over the long term. Good working relationships with suppliers will not only save costs but also reduce availability problems, delays and quality issues which result into a better service for consumers. Communication improves drastically through an effective supplier relationship management. The suppliers gain a complete understanding of the company they serve and this allow them to meet their needs more effectively. This prevents delays in the supply chain and the flows of operations improve significantly. Such a healthy relationship with suppliers makes it easier to resolve issues in the ordering process. Another important result of an effective SRM is customer satisfaction. Since you are able to deliver goods and services in time and free from defects, customers will enjoy doing business with you. They will feel their money is well-spent. Ensuring customer satisfaction means more business for you as well as for the suppliers. The suppliers will continue to deliver a good service to your organization and you will be able to provide a quality service too. This leads to stronger branding. Existing customers will stay with you as they are happy with the service. This can also leads to new clients. Good supplier relationships can mean that you can benefit from preferred discounts or other attractive deals. For example, good payment discipline can prompt them to offer you a cash discount if you settle the invoice within 30 days. Both the suppliers and buyers can better understand the inner workings of each other when specific areas of their businesses work together. In this way, both parties are able to adapt their own working practices and operations to better accommodate the other; this can lead to further efficiency and operational advantages. Therefore, consolidating the supply chain allow buyers to reduce the number of suppliers they purchase from; streamlining the purchasing process and making budgeting a more simple task. Relationships with suppliers are critical to business success. An effective supplier relationship management does not only deliver major savings but also major opportunities. Training and development programs can significantly develop the skills needed for the proper functioning of supplier relationship management. This will ensure a lasting relationship with your suppliers, resulting in a considerable improvement of the bottom-line of your organization.